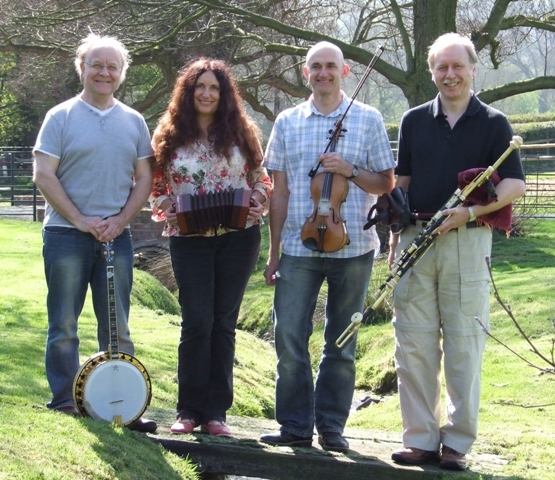 The Toads are a multi-instrumental band playing inventive arrangements of Irish music. They originally met through playing in some of the excellent Irish sessions in the UK and Ireland and share a deep respect for traditional Irish music. The name "The Flying Toads" came about as a spoonerism of the Irish hornpipe "The Flowing Tide"! Being a four piece band and each playing several instruments, the Toads focus on arrangements that explore the best blending of sounds and dynamics, as well as choosing tunes and songs that are exciting to listen to. Our songs range from well-known lively standards, to moving lyrical ballads. Our tunes are all taken from the Irish tradition. Our extensive repertoire of reels, jigs, polkas, hornpipes and airs ranges from fast and furious tunes for dancing, to haunting Celtic melodies to make you cry into your Guinness! Our dances are always a memorable event. We can provide the very best dance callers for weddings, ceildihs and barn dances.